For years, players participating in the $10,000 Koser Jewelers Pro Tennis Challenge have raved about the facility, the surrounding area and the overall experience of the event. The tournament had such consistently high reviews that the board at Hempfield Recreation Center even discussed the idea of hosting a bigger tournament with bigger prize money. Next week, that discussion turns to reality. The $25,000 Koser Jewelers Pro Tennis Challenge will begin Sunday at Hempfield Rec in Landisville, Pa., bringing together some of the world’s most up-and-coming players in the final Pro Circuit event before the US Open. Along with players from all over the country and from countries spanning the globe, the tournament will feature an impressive mix of players from Middle States. Simply based on date and proximity to New York, Pipkin said he expected a great turnout and strong player interest. With the entry list now official, he was certainly right. Qualifying rounds, which begin Sunday, include Casey Robinson (former standout at St. Joseph’s University in Philadelphia), Joelle Kissell (NC State University/Pittsburgh, Pa.) and Ronit Yurovsky (University of Michigan/Pittsburgh, Pa.). Many of these players grew up in Middle States, playing local tournaments and earning their way to top rankings, college teams and more. The main draw will begin Tuesday. This will be the second USTA Pro Circuit event of the summer for Pipkin and Hempfield, which earlier this year was named one of the USTA Middle States Premier Facilities for 2013. The facility hosted its yearly event in May, bringing in nearly 500 fans for the final. Former world No. 20 Alisa Kleybanova took the title. Hempfield wasn’t planning on hosting another tournament this summer, but the opportunity arose when the date usually taken by the Bronx Open – which is now undergoing construction at its tennis facility – opened up. Quickly, Pipkin jumped on the chance. 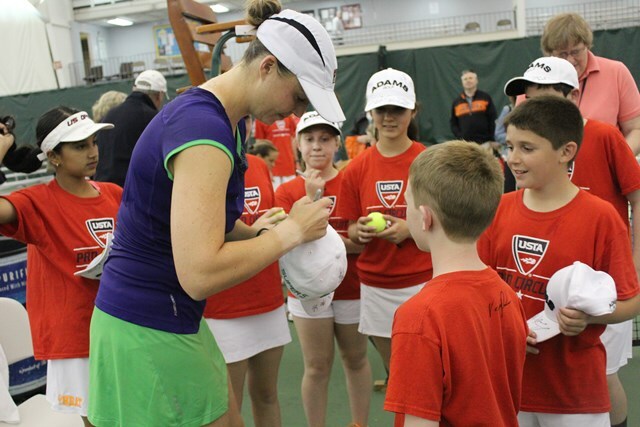 Hempfield is running plenty of events alongside the Pro Circuit, as well, including a player party (Monday), Pro-Am (Tuesday), high school clinic (Wednesday), Special Olympics day (Thursday) and a 10 and Under Tennis day (Friday). More info on the event can be found by clicking the links below.